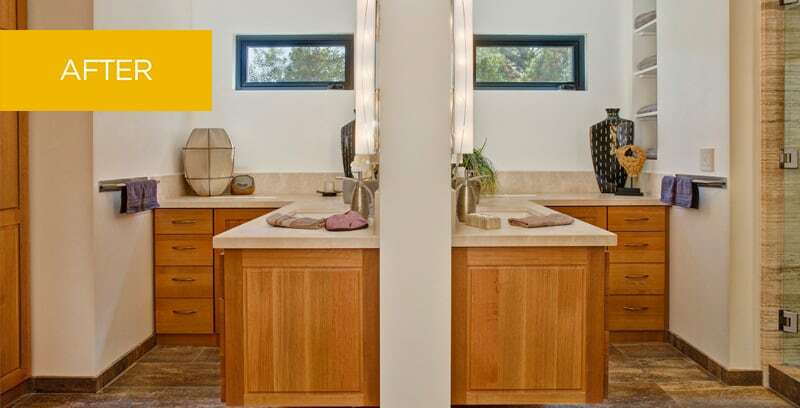 This modern organic master bathroom establishes two distinct areas for comfortable sharing and unifies a respect for nature’s colors and textures with an appreciation for clean, disciplined lines. 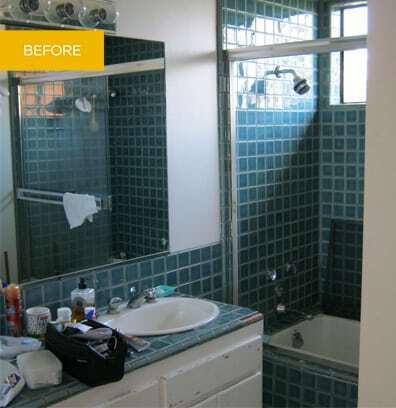 For a couple sharing a master bathroom in the home they have owned for more than 30 years, a sense of separate space was essential. They wanted a modern organic aesthetic with earthy simplicity. Space planning was critical for this master bath, created from the existing bathroom plus room borrowed from a little-used landing. Floating vanity cabinetry establishes a light, open feeling. Haze alzak recessed lighting, a mindful choice for environmentally conscious clients, provides the best light output with the least amount of glare. The walnut travertine flooring continues from the bathroom floor into the shower where three shower heads, including a hand held, provide maximum luxury within the streamlined glass wall. The dramatic slab travertine in the shower is reminiscent of the surrounding sandstone hills, much beloved by the clients.